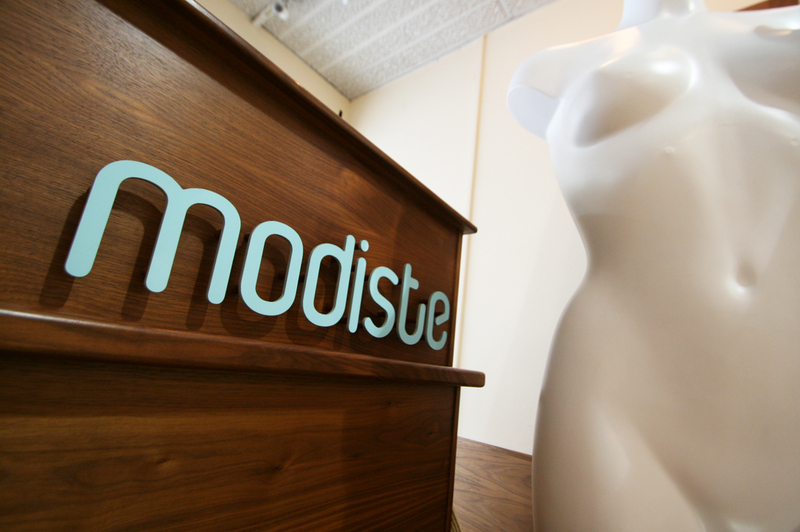 I had a phone call a couple of weeks ago from a Facebook friend Sue, who owns Modiste, a fab little contemporary boutique I’ve shopped at in Stockport. 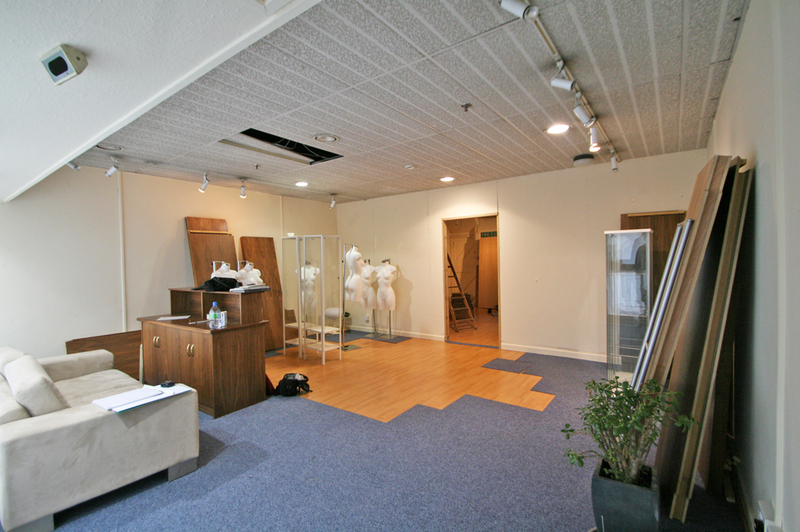 They were moving premises and needed an electrician to move some lights and possibly a joiner, could I help? Mr M & I popped over to take a look and just like with Green Tea restaurant last August, the job snowballed into a complete shop re-fit which had to be ready by, um, today! 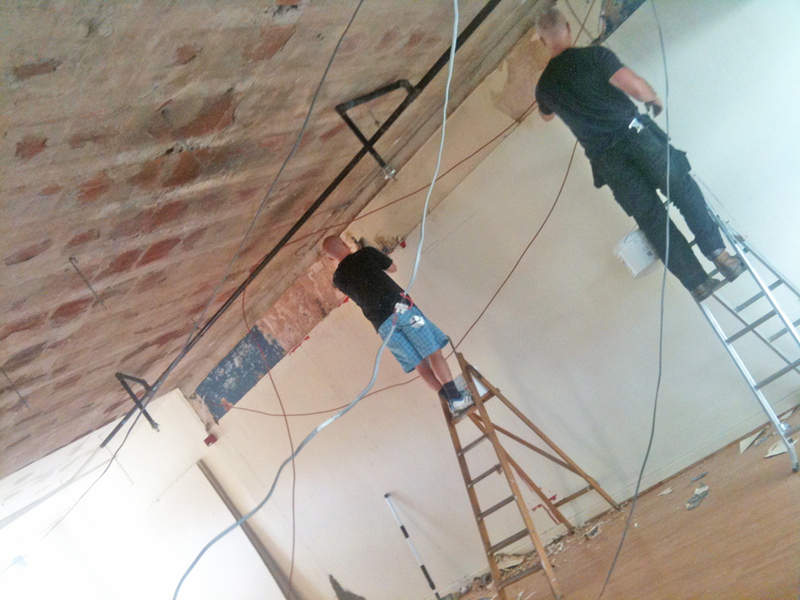 Electrics, stud wall removal & building, plastering, painting, unit building – there’s nothing like a challenge….. The walnut units and shop logos etc were to stay the same, giving a ready made palette of colours – it was more the dusty, dirty, builder work which had to be organised, with a little bit of design help where needed. Sue’d brought over her dismantled units, desk and sofa below, but the more she looked at the space, the more she disliked the false ceiling with it’s hideous David Brent style office tiles. 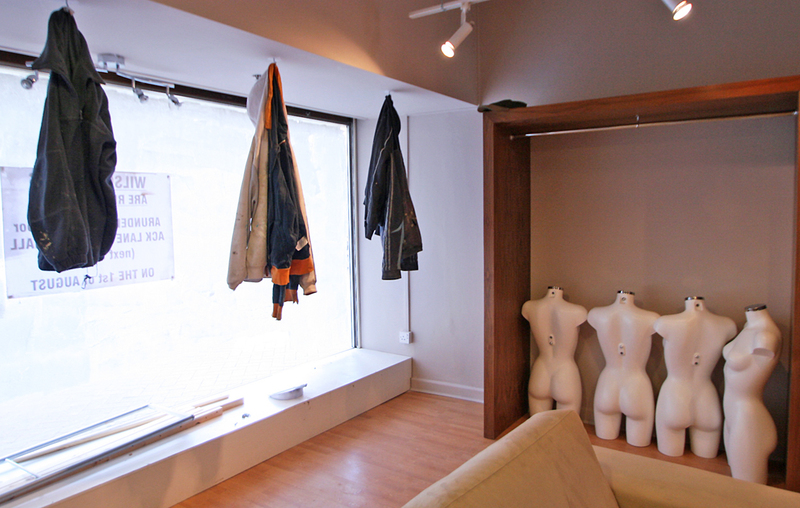 The wall with the doorway in it below was also to come down to open up the shop space to an equally large area to the rear. 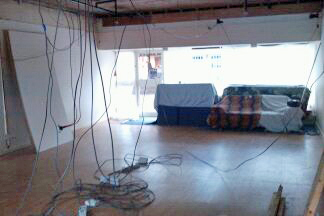 View from the door into the original office space, before our work started. 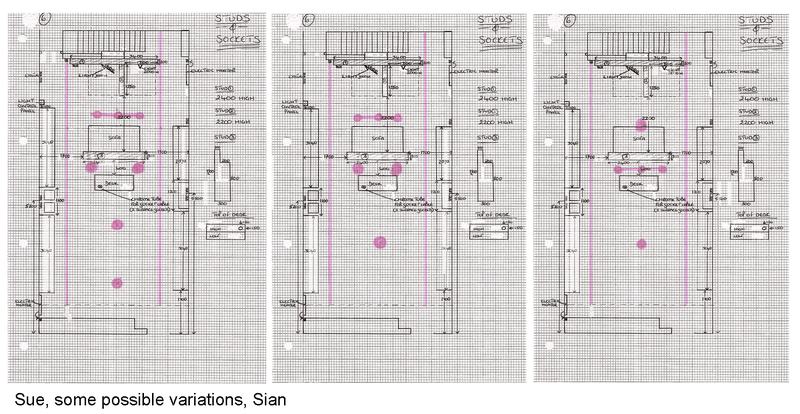 Not being a CAD girl, I drew up some plans for the layout, working with Sue and where she wanted the units so I could plan the moving of sockets / lighting etc. Because the walnut units fitted flush to the walls, all the existing trunking was in the way & sockets had to be moved and fitted in exactly the right places. Drawing up the space also allowed us to plan exactly where the changing rooms would go, the sofa, the new stud wall behind the desk and the desk itself, along with all the necessary distances between them. It’s surprising how many times people underestimate the amount of space required and find they have run out of room halfway through a building job if the proper planning wasn’t done at the beginning. This was vital as we needed access through the changing room stud for the original fusebox & had to drop wires from the ceiling down in the middle of the room through a chrome pipe for desk sockets & telephone connections because the laminate floor was being retained so no wiring could be done under the floor. Our work began two weeks ago and down came the ceiling along with a spaghetti junction of wires, perfect to give the electrician a where-the-buggary-does-that-wire-come-from headache. Once the false ceiling came down it was clear how, um, what’s the word… industrial the original ceiling was, with it’s exposed sprinkler system and the necessary trunking for cabling. Luckily Sue loved this look and wanted the ceiling painting, deciding on Dulux Timeless, along with all the pipework. The walls had to be patch plastered up at the top as well as a small band of woodchip removed, and then painted. 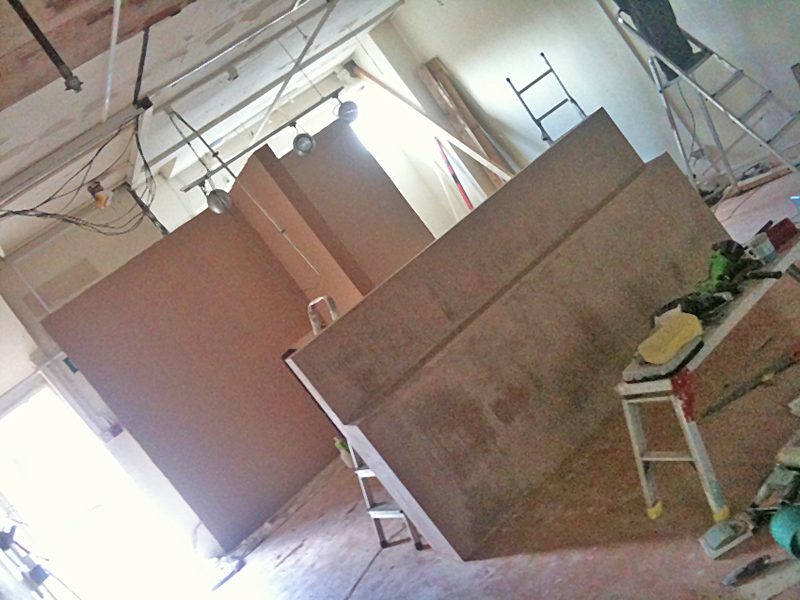 The boys built the studs up to my specification and they were then plastered. I suggested that the lower wall positioned behind the desk have a step in it, to allow Sue to use this on a practical level as well as it being the divider between the desk and the changing room area sofa. 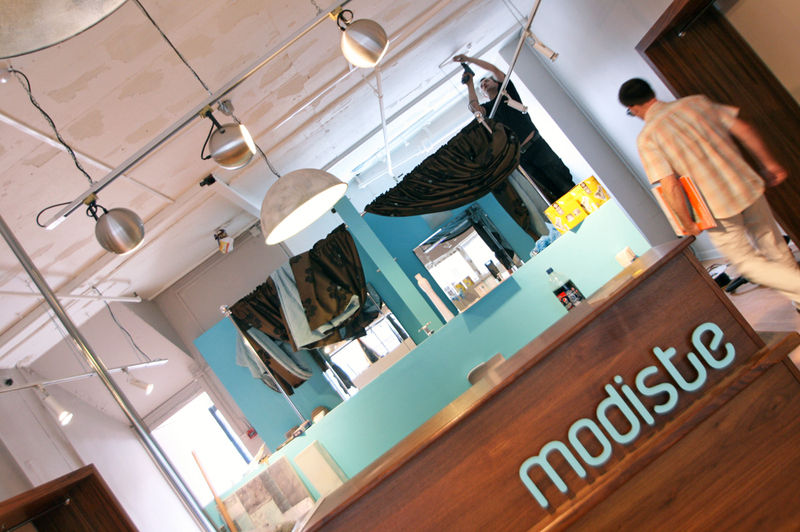 The main shop walls were emulsioned in B&Q Lauren and the changing room walls were to be in the same blue as the Modiste signs. 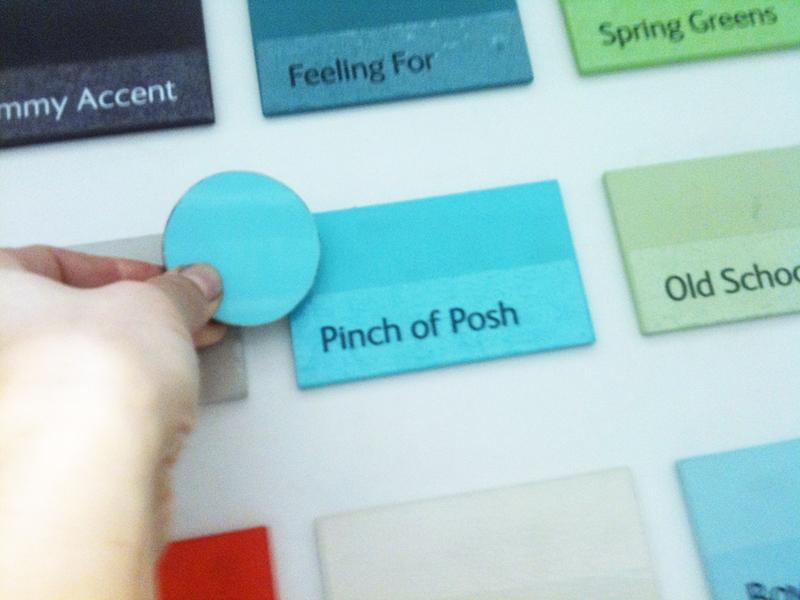 After a good rummage around testers, paint cards and sample sheets with the Modiste ‘dot’ below, the best and most vibrant was Laurence Llewelyn-Bowen’s Pinch of Posh, from his Graham & Brown range, also at B&Q. As luck would have it, on the very next day we headed out to buy a new sofa for one of the rentals and look what I came across….. PERFECT!!! 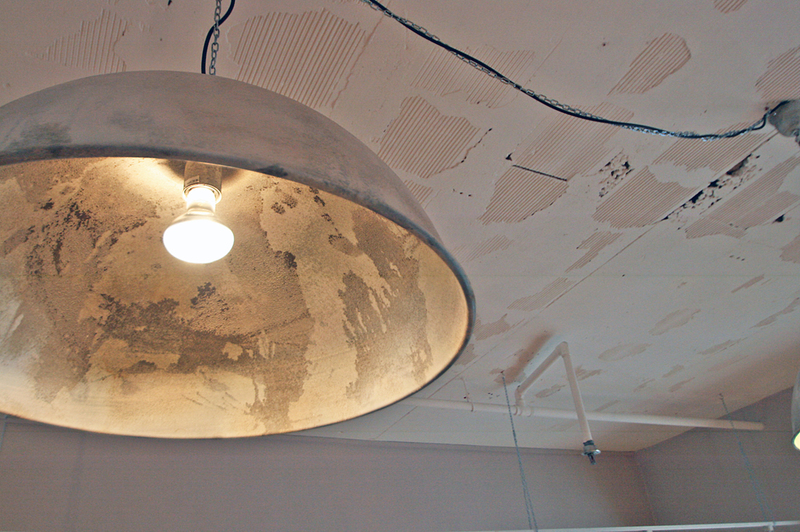 At 600mm wide with a rough textured finish & uneven surface, these lights fitted the bill exactly. Done and dusted in two weeks & a day, and 24hrs before schedule, giving Sue a little more time to prepare for the VIP opening on Thursday and the official opening this Saturday. I’ll take some images of the completed job, designer wear ‘n’ all on Thursday but am very proud of how hard we all worked to get this job finished. The space was stripped, given a pinch of posh and a good tickle up all on time and on budget for the client – I’ll be a happy bunny for a fleeting moment, but now on to the next one! Project Lauren / Modiste Designs launch night, finished bang on time! Watch out Nick Knowles, this girl’s on her way! Quite right, Richard, elbows at the ready! Tee hee. A brilliant job Sian. And a great team on site, throughout… they didn’t even eat the mini Mars Bars I left in the fridge for them.